Internal combustion engines need a mixture of air and fuel to run. The compressed mixture ignites pushing the pistons, which turn the crankshaft, and the car moves. Air gets to the engine through a small butterfly valve. To control auxiliary devices, a vacuum is created. A vacuum leak will cause unwanted air to leak into the engine in places where it is not required. This reduces the performance of the engine and causes some systems that are dependent on the vacuum to malfunction. Since the vacuum leak causes engine inefficiency, you will notice the engine light turning on the dashboard. You will also experience problems accelerating; this is because fuel is not being supplied effectively to the combustion chambers. The vacuum is used to operate actuators, sensors or power brakes in some cars. When there is a vacuum leak, some of the sensors may start misbehaving forcing you to perform unnecessary repairs. To identify a vacuum leak, you need first to understand how the engine air intake operates. Air comes in through the air filter, and the throttle valve controls it while creating a vacuum. You know that your car has a vacuum leak when it produces a hissing sound whenever you start it. Vacuum hoses after miles of use start to wear and tear; they become brittle and these results to breakages in certain areas. Carefully inspect your engine hoses and replace them if they are beyond use. Engines are different, and you need to first identify your car’s engine manual. This should have a diagram of the engine set up. There are some ways to check for vacuum leaks. Some are faster than others and some require some expensive equipment. Check out all these steps to find the best solution for you. 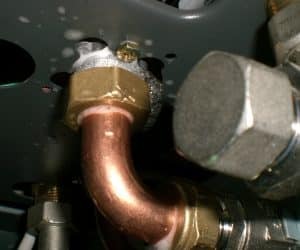 The first place to check for a vacuum leak is the hoses connected to the engine. Check for cracks or loose attachments. Each car has a unique engine hose set up. Ensure that the hose clamps that keep the hose in place are tight enough. You can do this by moving the clamps sideways; if they easily move then tighten them. If you still cannot identify the leak clean areas, you suspect of causing the leak and further inspect the surfaces. This is probably the easiest and cheapest way of how to check for vacuum leaks. By spraying soapy water around the intake and the affected hoses, while the engine is running and revving. You will see air bubbles pouring out if there are any leaks in the affected area. This is the professional way of how to do it and the way mechanics check for vacuum leaks within minutes. But you need some expensive equipment. If you are interested in investing in an awesome machine for finding vacuum leaks, you can check out our guide here: Best EVAP Smoke Machine. There those who use carburetor cleaner to detect vacuum leaks. In this procedure, put the car in idle and spray some of the cleaner on areas that you suspect to have vacuum leaks. The engine will start running faster when there is a leak. This is because the carburetor cleaner will get into the engine and burn with fuel. However, this is a dangerous method for checking for vacuum leaks because the fluid is highly combustible. 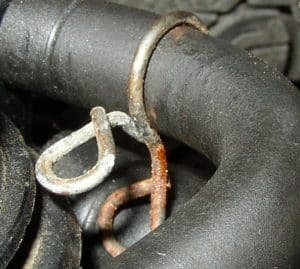 If your hoses are fine, the problem could be with the intake manifold. The intake manifold gasket at times leaks causing vacuum leaks. This should be located between the cylinder head and manifold. Spray some soapy area to clean the area and reveal any leaks. To check for the intake manifold leaks set your car to parking or neutral. Ensure that the wheels are immobile. Start the engine and let it remain idle for a few minutes. Use the soapy water spray to the area between the intake manifold and the cylinder head and at the base of the carburetor. Listen to the noise coming from the engine – if it smoothens out when spraying then the vacuum leak is on the intake manifold and is need of repairs. 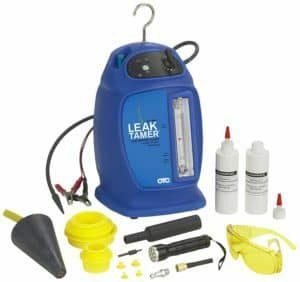 What are the symptoms of a vacuum leak? The first symptom of a vacuum leak is your engine light will turn on. There many reasons for the light to turn on and you need to rule out other causes before you conclude it is a vacuum leak. But, you are sure it is a vacuum leak if it is accompanied by a hissing engine sound and loss of power. If your car is not peaking even after accelerating, then there could be a vacuum leak. A vacuum leak can cause further engine problems like fuel inefficiency. If you are suffering from a damaged vacuum hose, you do not need to purchase a new one if the damage is not that extensive. Then vacuum hose is long, and you can cut off the damaged part and reattach it to the engine. The most delicate damages are those at the ends of the hose. You can use a sharp kitchen knife to chop off the ends. Always ensure the hose clamps have been tightened to prevent further leaks. There those vacuum leaks that are caused by hose being exposed to hot engine surfaces. You will need to reroute the hose from the hose. After repairs start your engine and keep it at idle. Listen for any hissing sounds. When you decide to replace a vacuum hose replace it with a similar one of the same length and diameter. Vacuum hoses are designed for specific places like brake booster or PCV. Having a vacuum leak can cause your car to be slow in acceleration. It could also hinder the efficient fuel/air mix in the combustion chambers. Damaged hoses are the main culprits for vacuum leaks. You can repair small hose leaks by chopping off the damaged parts – if they are at the ends. If this does not work, you will be forced to purchase new hoses. V6 vs V8 Car Engine - What's the difference? What is a Blow By – can it be fixed easily?